How to export my private key from the system certificate store into a file? 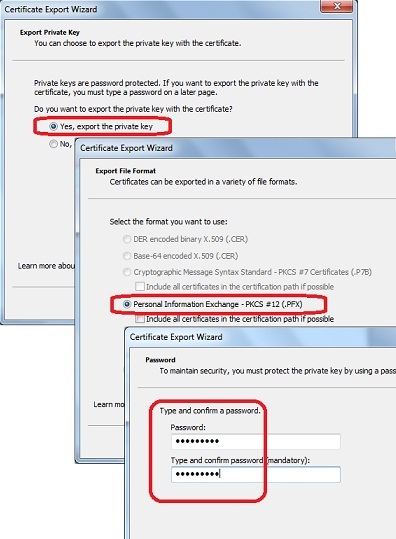 The "export the private key" option is grayed out on the Certificate Export Wizard. By default, private keys stored with certificates in system stores are not allowed to be exported to avoid the risk of passing your private key to others. If you want to export the private key, you need to make it "exportable" when you create the private key with the "makecert.exe -pe" as shown in this tutorial. 2. Run the "certmgr.msc" tool and open the "TestStore > Certificates". You see "Lily Dews" certificate shows up. 3. Right-mouse click on "Lily Dews" and select "All Tasks > Export...". You see "Certificate Export Wizard" showing up. 4. Click "Next". You see "Export Private Key" screen showing up. 5. Check "Yes, export the private key" option. This is not grayed out any more, because the private key was set to "exportable". 6. Click "Next". You see "Export File Format" screen showing up with only only file format available: "Personal Information Exchange - PKCS#12 (.PRX)". 7. Click "Next". You see "Password" screen showing up. This is needed to protect your private key in the output file. 8. Enter "FYIcenter" and click "Next". You see "File to Export" screen showing up.  2014-01-29 Pegasus: how private key works, if I press none button on create private key password GUI.